Moscow City Hall is located at 206 East Third Street, Moscow, ID; phone: 208-883-7080. Photo: Mason Cornwall House, ca. 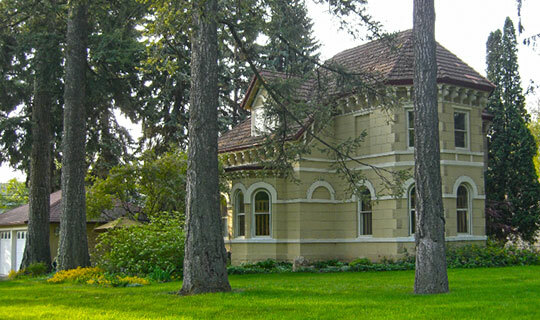 1889, 308 South Hayes Street, Moscow, ID. Listed on the National Register of Historic Places in 1977. Photographed by User:Robbiegiles, 2007, [cc-by-2.5 (creativecommons.org/licenses/by/2.5/deed.en)], via Wikimedia Commons, accessed July, 2015. Moscow was not always known as "Moscow." Camas (a flowering bulb that was an important staple of the indigenous Native American diet) was once abundant and regional tribes of the Nez Perce, Coeur d'Alene, and Palouse would gather annually in the area to collect the roots. It was the Nez Perce that first called the area Tatkinmah [Tat-Kin-Mah, tukkinma, or Taxthinma] referring to the abundance of deer fawns that were present while they gathered the starchy food source. The first permanent settlers of the area found that their pigs thrived from feeding on the camas roots, and the area was dubbed "hog heaven" for a time. The area was generally referred to as Paradise Valley and when the first post office, located at the southeast corner of Mountain View Road and Hillcrest Drive, was granted to the settlement in 1873, it was called "Paradise." When a new post office was established in 1876 at the southwest corner of First and Main Streets by Almon Asbury Lieuallen, the postal service requested a name change. Samuel Miles Neff is accredited with choosing the name of Moscow. Although the reasons for Neff's choice are not clear, it is suggested that the meaning of "city of brotherly love" was a desirable connotation for the community, and he was likely influenced by the fact that he had been born near Moscow, Pennsylvania and had previously resided in Moscow, Iowa. Although there was no permanent settlement by the three nomadic Native American tribes who visited the area to gather camas root and for other reasons, it was an important area to their cultures. The Nez Perce were the primary inhabitants of the area and became skilled horsemen. The tribe first obtained horses in the late 1600s and early 1700s and bred the horses for speed and endurance. These spotted horses became famous well outside of the region and are known as the Appaloosa. At one time, thousands of these horses could be seen on the Palouse. After the War of 1877, in which the United States government moved the tribes onto reservations, the horses had mostly been destroyed or confiscated. Even though the war occurred away from Paradise Valley, the settlers at the time were afraid of attacks and built three stockades to protect themselves. The most famous is Fort Russell, which was located northeast of present day Main Street; a historic neighborhood in the same area is named for this fort. The others included: Fort Howard, which was located northeast of town, and Fort Crumerine, which was located at the east end of present day Sixth Street. Moscow's beginnings were humble, but the community has prospered due to a series of events that allowed the community to develop. Fur traders arrived in the area as early as 1809 and missionaries came to the area in the 1840s. Others came during the 1850s when a route for the Northern Pacific Railroad was sought out and documented. Some prospectors appeared in the 1860s and mining occurred in the region for decades after. Homesteaders arrived in the early 1870s and laid the framework for what was to become Moscow. Samuel Miles Neff opened the first general store in Paradise Valley in 1873; it also served as Moscow's first post office. Another early and important homesteader and businessman was Almon Asbury Lieuallen. Although he homesteaded in 1871 east of present day Moscow, Lieuallen bought Neff's claim in northeast Moscow in 1875 and established a general store at the southwest corner of First and Main Streets. This location also served as the Lieuallen residence and the community's second post office, which was called Moscow. In 1876 four homesteaders, whose claims met at the corner of Sixth and Main Streets, agreed to donate 30 acres of land each to establish a city center for the community. Almon Asbury Lieuallen owned the northwest portion, James Deakin the southwest, Henry McGregor the southeast, and John Russell the northeast. The namesakes of each founder may be found to this day in the street names, plats, and neighborhood identities of each quadrant. During the late 1870s, Moscow established itself as a center for business and trade. Previously having to travel 150 miles by wagon to Walla Walla, Washington, for goods and supplies, settlers of the area could now conduct business in the community. Early businesses included a dentist, doctor, sawmill, hotel, and blacksmith shop. The opening of the McConnell Maguire General Store in 1879 was large enough to draw consumers from nearby communities. By 1880 the population of Moscow had grown to 300 persons and the community continued to thrive with the establishment of a flourmill, church, brewery, and newspaper in the early 1880s. Soon, a school followed on land donated by homesteader John Russell and the first brick building that housed one of the first banks was constructed by Lieuallen in 1885. Moscow was incorporated on July 12, 1887 after growing in population, partly due to the development of a Union Pacific Railroad depot. The following year, Moscow had become the largest city in Nez Perce County and requested to become the county seat. Representative Fred Duboise, after Moscow's failure to become county seat, pushed a bill through the United States Congress to carve out Latah County from the northern part of Nez Perce County, thus creating the only county formed by an act of Congress. When Moscow became the county seat of Latah County its citizens dropped their support for the county to join Washington in statehood. Another great movement in 1888 included Moscow's journey to become the site for Idaho's land grant college, the University of Idaho. Congress had approved a measure severing the Idaho panhandle from the rest of the territory and attaching it to Washington; however the bill was stopped by President Grover Cleveland due to protests from Governor Edward A. Stevenson. This action angered the residents of the north who favored joining Washington, fueled by Lewiston's loss of the territorial capital to Boise in 1865. As a gesture of peace to the north, the 1889 territorial legislature designated Moscow as the location for the public university. Council Bill 20, known as the university's charter, was signed into law on January 30, 1889, and became a part of the state constitution when Idaho was admitted to the Union in 1890. City of Moscow, Idaho, Comprehensive Plan, 2008, www.ci.moscow.id.us, accessed July, 2015.